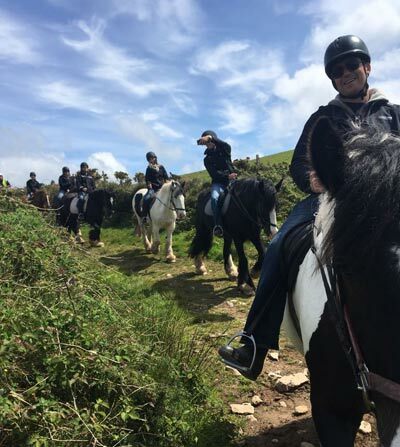 See our range of treks from beach to mountain trail rides. DESCRIPTION: Our 2hr trek allows you to enjoy the best of both worlds. 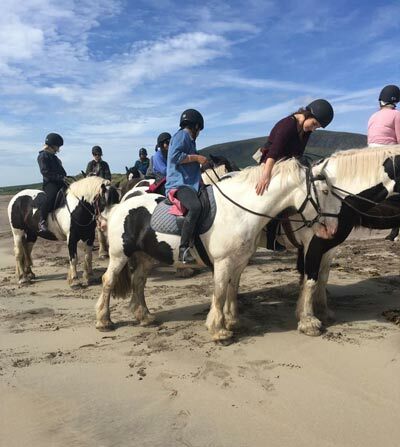 Ride along the golden sand of Ceann Tra and over the scenic Cathair Bó Sine mountain trail. This trek is a must for anyone looking to take in all the most beautiful views that Ventry has to offer. This trek can be enjoyed by all and will be suited to your level of experience. 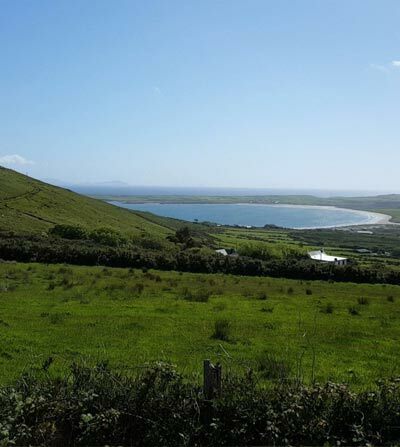 DESCRIPTION: Ventry is surrounded by wonderful country side which you can explore on our Mám an Óraigh mountain trek. 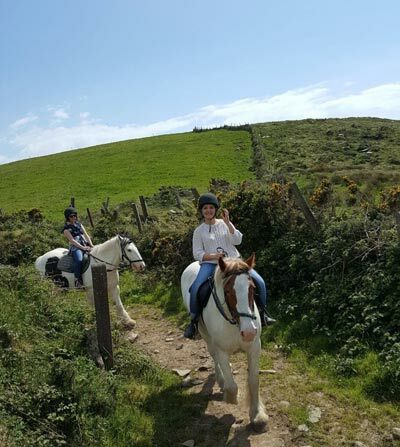 This trek can be enjoyed by all and will be tailored to suit all levels of riding experience We take in the spectacular scenery of the skelligs and all of ventry bay. Following the pilgrim’s path up to the top of Cathair Bó Sine where we can see Mount Brandon and overlook Dingle Town and Bay. 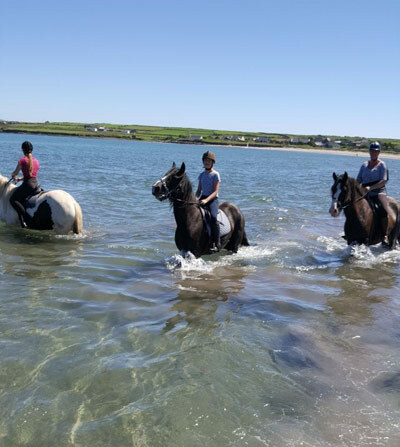 DESCRIPTION: Located just a short ride from our farm is the picturesque beach of Ventry Bay. Taking in the views of the beautiful Ventry countryside and the Iveragh Peninsula across the bay. Our beach trek can be enjoyed by all at a leisurely walking pace along the water’s edge. 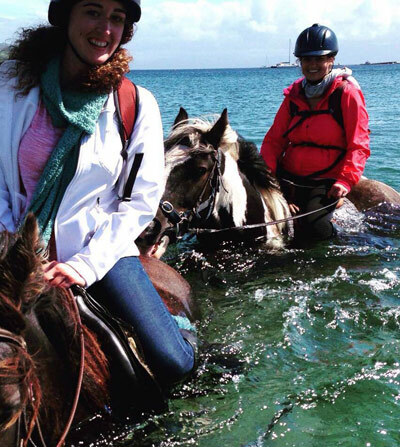 For those with adequate experience in English style riding, a gallop along the beach is a once in a life time experience. If the gallop is beyond your level of experience, we will gladly offer you the opportunity to enjoy a trot or canter in a more controlled environment back at the farm. What style of riding do you do? How do I judge my riding ability? Here are some guidelines to help you judge your riding ability: Beginner: A rider with little or no experience. Novice: A rider who is comfortable and in control at the walk and/or trot but has limited experience trotting and/or cantering. Intermediate: A rider who is confident and in control in all paces (including posting trots, two point canters and gallops), but does not ride regularly. Strong Intermediate: An intermediate rider who is currently riding regularly and is comfortable in the saddle for at least 6 hours per day. Advanced: All of the above plus the ability to handle a spirited horse in open country. Are Riding hats and boots provided? Yes, we have a selection of Riding hats and boots for you to use. The health, safety and comfort of both our riders and horses is important to us, for these reasons weight restrictions are required. Weight restrictions may vary depending on; level of riding ability, height and fitness. Our instructors reserve the right to refuse riders in the interest of safety. We appreciate your understanding concerning this matter.